PANAJI: City Mayor Surendra Furtado has blamed the water supply and sanitation wing of the public works department for water-logging in the city, stating that the faulty laying of new water pipelines in the city, including on 18th June Road and in front of the Corporation of the City of Panaji (CCP), by this department is responsible for the same. Speaking to ‘The Navhind Times’, Furtado said that the CCP had given NOC to the PWD, last year, for digging the roads so as to replace the entire water pipeline in Panaji, in a project under the Jawaharlal Nehru National Urban Rural Mission (JNNURM). “However, the PWD laid pipelines of 60 inches and 70 inches diameter across the underground drains, which now blocks the smooth draining of the rain water,” he added, pointing out that the technical cell of the PWD, as well as the then ruling side at the CCP failed to oversee the laying of new water pipelines in the capital city. “Furthermore, the high tide at around 3 p.m. today aggravated the situation, flooding most parts of the central city,” the City Mayor noted, maintaining that unless a permanent solution is found for this problem, the city would continue to flood after heavy rains. He also informed that before the faulty laying of the water pipelines, last year, the CCP had succeeded to controlling the water-logging in the city that had been posing inconvenience to the city residents for long. It may be recalled that last year, the PWD under the JNNURM had replaced all old pipes of asbestos cement, galvanized iron, cast iron and PVC with new HDPE (High Density Polyethylene) pipes. The area covered by this new pipeline, stretched from Dona Paula to Ribandar, with a total length of 87 kms. 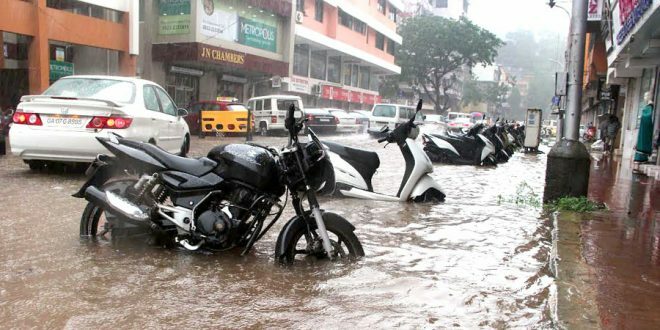 Meanwhile, PWD executive engineer Dilip Dhavalikar told this daily that the laying of new water pipelines in Panaji has nothing to do with city flooding. “We had laid the water pipelines by taking a road-cut, and moving away from the underground drains,” he informed, observing that the high tide, on Monday evening, must be responsible for the water-logging in the city.